NEW: Cyclist Video Evidence – Improving Cyclist's Safety Through Near Miss Mapping, Warning and Enforcement – Before Collisions Occur! The Sylvia Bingham Fund - started in honor and memory of Sylvia who was hit and killed in Sept. of 2009. It helps to prevent further incidents like the one that took Sylvia's life. Yield to Life - like-minded organization started by former pro bike racer David Zabriskie who has been hit 3 times, once very seriously, by motor vehicles while riding his bike. Compassionatefriends.org - the nation’s largest self-help bereavement organization for families that have experienced the death of a child. Their 620 chapters nationwide do a lot of work to help grieving families (bereaved parents, siblings, and grandparents) and provide support when the worst has happened. Bicyclelaw.com - (Personal Injury Lawyer for Bicyclists Nationwide) offers bicycling accident advice for cyclists including those injured by motorists, unsafe conditions and defective cycling products. Alliance for Biking and Walking (Formerly Thunderhead Alliance) - ... is a coalition of over 120 local and state grassroots bicycle advocacy groups working in 48 states and one Canadian Province. They work by helping new and established bicycle advocacy organizations learn from experienced advocacy veterans and leap-frog to a high level of effectiveness in a short period of time. America Bikes - Leveraging Federal Transportation Dollars for Bicycling and Walking - ... here to ensure the billions of dollars going to transportation improve bicycle and walking in your community. The Bicycle Coalition of Greater Philadelphia is compiling newspaper reports of cycling deaths for April/ May 2008; these are represented visually using Google map technology. PeopleforBikes.org (formerly Bikes Belong) - People for Bikes works to put more people on bicycles more often. From helping create safe places to ride to promoting bicycling, we carefully select projects and partnerships that have the capacity to make a difference. Bike Texas - Texas Bicycle Coaliion - ... has pushed the boundaries of Safe Routes to School (see below). Bicycle Transportation Alliance - The BTA has been opening minds and roads to bicycling in Oregon since 1990. Through education, legislation and advocacy, BTA has helped make Portland, Oregon, the recognized leader in biking in the USA. Broken Bikes Broken Lives - pictures of memorials placed around St. Louis documenting where cyclists have been hit by cars. Ghostbikes.org - (Global group of volunteers) The first ghost bikes were created in St. Louis, Missouri in 2003, and they have since appeared in over 80 cities throughout the world. GhostCycle.org - The Ghostcycle project is to raise awareness for everyone regarding bicyclists on the streets of Seattle, WA. Jeff Roth Cycling Foundation - funds awareness and safety campaigns to schools and the community (Maryville, Tennessee) while also providing assistance to families that have been affected by a cycling tragedy. Leage of American Bicyclists -To promote bicycling for fun, fitness and transportation and work through advocacy and education for a bicycle-friendly America. Marin Share the Road Program- Marin Co., Calif. - Marin County Bicycle Coalition (MCBC) has been steadily improving their county’s road and path facilities for walkers and bikers since they formed in 1998. Safe Routes to School National Partnership - ...is a network of more than 300 nonprofit organizations, government agencies, schools, and professionals working together to advance the Safe Routes to School (SRTS) movement in the United States. Share the Road Cycling Coalition - (founded by Eleanor McMahon in Ontario, Canada) Following the death of her husband, OPP Sergeant Greg Stobbart -- killed tragically in a cycling collision in June 2006 -- Ms. McMahon has been working to engineer legislative change in Ontario and is leading the development of a provincial, grassroots cycling advocacy organization in Ontario -- the Share the Road Cycling Coalition. In November 2008, Greg’s Law was tabled in the Ontario legislature as part of a larger Road Safety Bill, Bill 126 and it passed on April 22nd, 2009. Contact us if you'd like to support the Ride of Silence through a portion of sales of your products or services. This is an exhaustive resource guide full of statistics on what's being done at the federal and state levels to combat distracted drivers. It's full of excellent data. Complete Streets Act of 2008 - On March 3, 2008, Senators Tom Harkin (D-IA) and Tom Carper (D-DE) introduced S. 2686, the “Complete Streets Act of 2008.” The bill is drafted to promote the design of safer streets for all users. NHSTA' Fatality Analysis Reporting System (FARS) web-based tool - FARS is a nationwide census providing NHTSA, Congress and the American public yearly data regarding fatal injuries suffered in motor vehicle traffic crashes. Summary stats on "pedalcyclist" fatalities for the past 13 years are available. SIX Bike/Ped/Transportation Bills Passed in Maryland! Apr. 12, 2010. "Pedaling in Tandem: How bipartisanship with motorists helps Colorado cyclists get over some mountainous disputes." Bicycle Times, 03/08/2010, Issue no. 5. Oregon's Landmark "Vulnerable Users of Public Right of Way" Law (HB 3314) Passes and becomes law Jan. 2008 - article here with more commentary on this new law that has potential to greatly improve cyclists' on-road safety & rights. The Jeff Roth and Brian Brown Bicycle Protection Act of 2007 was signed into law on May 3, 2007, by Tennessee Governor Phil Bredesen. Tennessee joins a handful of states that have moved forward to further protect cyclists on our roadways. Link to the actual bill. Interactive map charts traffic fatalities (11/23/11) - ITO, a UK-based transportation data and mapping firm, has released this interactive map of the United States that shows all traffic fatalities from 2001-2009. TV news interview re: RoS with Michigan organizer, Dave Duffield, Sept. 23, 2009, (scroll past the first interviewee about ½ way through). 8 (Arizona) students help to create memorial to bicyclists. Arizona Daily Star, 08.17.2009. "The first permanent memorial for bicyclists killed on the streets here was installed just north of downtown on Friday." 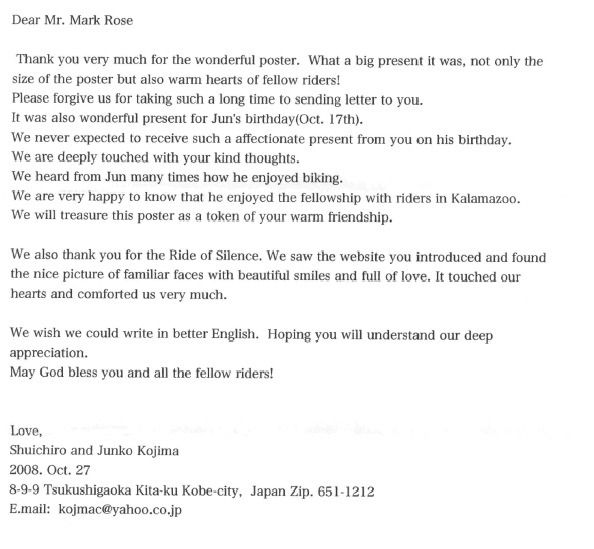 Iowa DOT newsletter, July 2009, Ride of Silence article (pg. 16). More than 100 riders took part in the 2009 Ride of Silence in Ames May 20 to honor the memory of DOTer Mark Snopek was killed Aug. 8, 2007. Ross Dillon was struck from behind by an inattentive driver on June 3, 2002. See Me Save Me (UK), is a campaign website coordinated by RoadPeace, the national charity for road traffic crash victims, dedicated to reducing truck danger and saving lives. Remember Me (UK), is an internet memorial site to remember those who have lost their life in a road crash (apparently for road crash victims of all types). 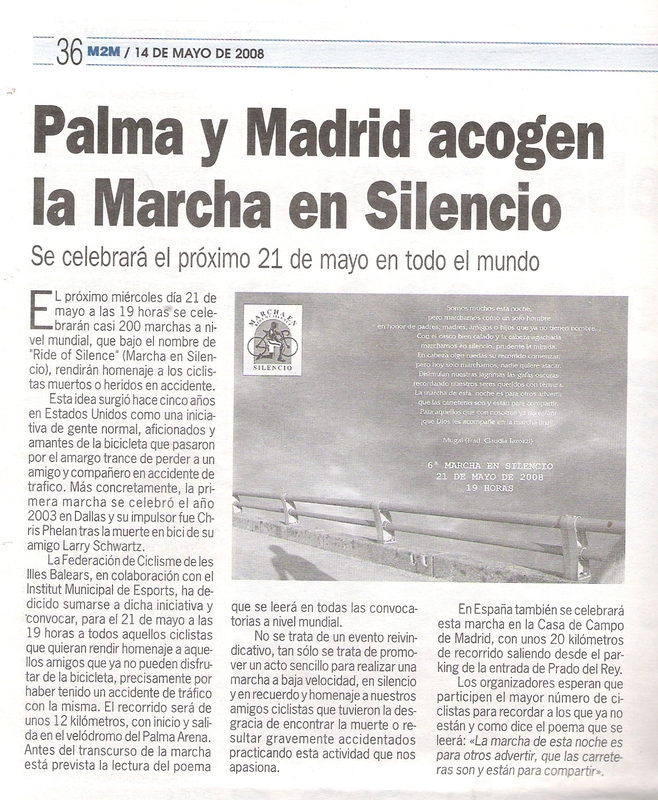 Amigosdelciclismo.com (Spanish) PSA re: Ride of Silence in Spain | Forum re: RoS on same site. Advocacy Resources (courtesy League of American Bicyclists)- "Making a successful case for bicycling and walking priorities requires two things: great stories and great data." How many bicycles are sold each year? Why do people ride? What are the numbers on bicycling crashes? Find answers to these and other questions here. Memoriam Powerpoint slideshow - web browser viewable (best viewed with Internet Explorer); show before or after rides, or during stationary group rides (this has a Michigan focus for now as it was generously created by Mark Hagar, the RoS Club Communications guy and Michigan Coordinator. Here's the PowerPoint file (11 mb, from 2008) which you can download and then run off your computer much faster than thru the web browser version.